Spike Lee has left me confused after viewing his new WWII epic Miracle at St. Anna. This film is a jumbled mess of great sequences, surreal moments, and short bridge scenes thrown in to advanced a contrived plot and then left on the floor to possibly come back to at the end. I give the marketing people credit for keeping a veil of intrigue over the movie, never really delving into what the plot truly is. At the heart of the story is a little boy who has experienced a great tragedy, one we can’t know until the end, that becomes a good luck charm to a band of four Buffalo Soldiers abandoned in enemy territory because their racist captain didn’t believe they could have gotten to the position they were. The boy, young Angelo, is the most important cog in the machine; as much an angel of protection as a boy needing shelter, his inclusion drives the decisions of everyone involved. Whether we knew his tale at first or if it is better finding out later on is debatable, however, the use of flashbacks throughout to explain the present, which is really the past itself—a story being related to a journalist as the sole survivor of the 92nd Infantry awaits a murder trial, that doesn’t actually get told to him—makes getting a foothold difficult. Some scenes seem to only exist for Lee to infuse a little racially motivated commentary, others are there to create the one event that is necessary to move the plot to where it must go, and yet more that just confuse because of their unnecessary inclusion. It all starts with a postal teller killing a customer—the two appear to recognize each other—with a German pistol. He shows no remorse for the crime and instead goes to jail without speaking a word. Only when a young newsreporter played by Joseph Gordon-Levitt talks his way into a story by charming a police Detective on the case, John Turturro, does the man open up and speak the words I’ve used to label this review. 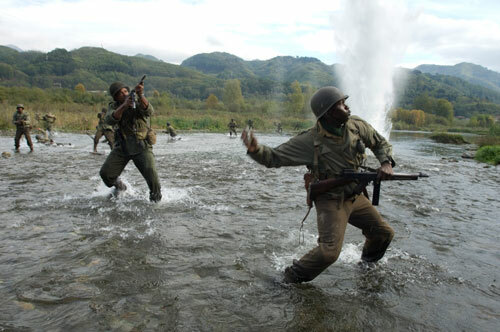 The film now transitions to the Italian countryside in the midst of the war, our Buffalo Soldiers trekking along with orders to cross a forthcoming river. You believe this is our postal employee telling the reporter what happened, but when you see the end you will realize it must just be a retelling for the audience. And here is a main flaw for me; a lot of the scenes shown are there for us, thrown onscreen to open our eyes to details we don’t know. They aren’t always fluid, but rather abrupt vignettes that at first seem to be meaningless until they are possibly returned to. Making matters worse is the fact that they are usually inhabited by star cameos, leading the viewer to believe the scene contains important characters, when in fact it appears that Lee just called in a lot of friends. You rarely see anyone more than once—John Leguizamo, D.B. Sweeney, Kerry Washington, even Gordon-Levitt and Turturro. I almost would rather their parts be played by unknown actors because I wouldn’t put more stock into their roles than is needed. There is one cameo that works well, but only because he is an integral part to the story. Walton Goggins, with even more redneck sensibilities than his role of Shane in the great “The Shield”, plays the racist Captain that leaves our heroes alone in Italy with the Germans hot on their tails. Even so, he could have been anyone too, but I’m glad for Goggins because it’s nice to see him on the big screen once in a while. However, the four survivors of an ambush on the 92nd are our main contenders here. And the funny part is that besides Derek Luke, I only had a cursory knowledge of the others, and that was by face recognition only. So, our leads are the no names surrounded by the stars. It’s an interesting maneuver, one that just hindered the story being told. It’s too bad because the foursome is great across the board; they didn’t need the bolstering of familiar faces on the periphery. With a ton of religious overtones, Omar Benson Miller astonishes with his overabundance of faith. Playing Train, the soldier who finds Angelo and becomes his surrogate father/friend—the young boy’s Chocolate Giant—he is a fascinating creature. Kind of like Lennie from “Of Mice and Men”, Train has a huge heart that overcomes him at times. The bond with the boy is strong and, in order to protect, will possess him with power, strength, and anger. Like the sleeping man of the mountains, (talk about a heavy-handed comparison by Lee), Train is an invisible warrior with his statue head constantly being rubbed for luck. His faith in God may be childish in nature, but it works as he never gets bogged down by lust and hate like his compatriots. He is just a man trying to survive and watch over his ward. There is a lot more going on besides the protection of this boy, yet things that come to conclusion because of his presence. He allows the men to join with an Italian family as they nurse him back to health; he is the reason they stay behind against their Captain’s orders to evacuate, leading into the best part of the film as the Germans come and take on the four Americans in a thrilling sequence; and he is the reason for a rift in the bond of a group of Partisans, Italians fighting against the Fascists. It all revolves around the child as he plays an unconsciously Jesus role in orchestrating everything. At times I started thinking that maybe he didn’t exist at all, maybe he was a manifestation in the story being told, a guardian angel himself for this group of men. Matteo Sciabordi is fantastic, breathing an abundance of life into a boy mired by tragedy in a world imploding around him. I think this could have been a better film if it focused only on his relationship with the soldiers, leaving the flashbacks, the racial politics, and the sub-stories all dancing around on the cutting room floor. As it is now, the sprawling tale is just too much to assimilate when so much is fluff surrounding the power young Angelo holds over the rest. Matteo Sciabordi, Omar Benson Miller (behind Matteo) Michael Ealy, Derek Luke (forefront), Laz Alonso. 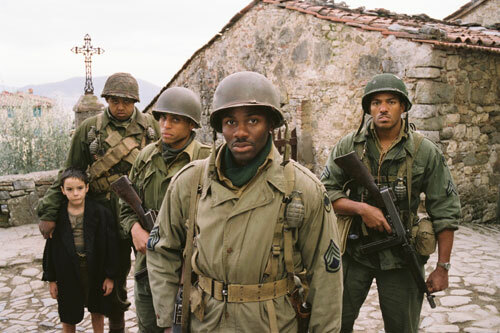 This film chronicles the story of four African-American soldiers stationed in Tuscany, Italy during Word War II. ©2008 Buffalo Soldiers In Italy, LLC – ON My Own Produzioni Cinematografiche S.R.L. I agree with you, I think this movie had the potential to be a great movie had they left out the sub stories and focus on the 4 Black soldiers and the boy. I was watching the movie and even half way through the movie I did not really grasp the plot of the movie. Reason being I kept tying what was going on the past to what happen at the beginning of the movie (when the guy got shot). For the life of me I could not make the connection. Overall it was not a bad movie, but I think it could have been great. I’ve seen miracle about 3 times, just once completely. This one of those few movies that gets better each time I see it. Granted I didn’t “get it” either the first time round. I however am glad for the sub plots. They made me “think” the second (and third) time around. Its almost like a getting a puzzle that gets more interesting each time you put it together. Almost a new movie each time I watched it. Is it Oscar material? Kinda but not really. I have been trying to fight the impulse to have a movie come together too neatly and that I have to “get it ” the first time around. More like a good novel. Just my 2 pesos. thanks for that. there was a lot i did like about the film, so maybe seeing it again will let it congeal a bit more. i appreciate the dos pesos. I know who the sleeping man is. ( I got it) When the Italian man saw Trains Silhouette against the mountain of the sleeping man. He said the sleeping man. meaning Traine. He wasn’t totally wrong. because the sleeping man in traine awoke. And when Hector said,”I know who the sleeping man is. He spoke of himself. We all have a sleeping man within us and when the arrows of injustice becomes too much to bare. Some of us will awaken and unleash our sleeping man. It was genius. I followed the movie and plot all the way! It was one of spike lee’s best! AAAAAA! i love the movie but YAYAYYAYA! THANK YOU ‘phil neel”!!! u anwered the question for me!!! thank you! It was sleeping man in the movie, we call it YOU HAVE AWOKEN A SLEEPING GAINT. AS IN THE GOP.